In a follow-up on the multistate outbreak of Vibrio parahaemolyticus infections linked to fresh crab meat imported from Venezuela, the Centers for Disease Control and Prevention (CDC) said yesterday that the outbreak investigation is over. As of September 18, 2018, 26 Vibrio parahaemolyticus illnesses were reported from Colorado, Delaware, District of Columbia, Louisiana, Maryland, New York City, Pennsylvania, Virginia. Nine people were hospitalized. No deaths were reported. Epidemiologic, laboratory, and traceback evidence indicated that crab meat labeled as fresh or precooked and imported from Venezuela was making people sick. In interviews, ill people answered questions about the foods they ate and other exposures in the week before they became ill. Of the 24 people interviewed, 22 (92%) reported eating crab meat in homes or restaurants. FDA and regulatory officials in Maryland traced back the source of the crab meat from restaurants and grocery stores and identified multiple Venezuelan suppliers. The investigation did not identify a single firm as the only supplier of crab meat linked to the outbreak. The Maryland Department of Health (MDH) warned Maryland residents on July 6, 2018, not to eat any fresh lump crab meat imported from Venezuela. MDH investigators collected unopened containers of crab meat from several stores where ill people reported buying lump crab meat. Multiple samples from several brands contained Vibrio parahaemolyticus. 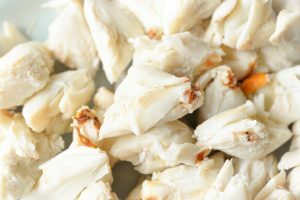 However, whole genome sequencing showed that isolates of Vibriofrom the crab meat were not genetically related to the outbreak strain. As a result of the outbreak investigation, FDA increased testing of fresh crab meat from Venezuela. FDA testing did not find Vibrio parahaemolyticus in any samples tested, but did find Salmonella and Listeria monocytogenes bacteria. That contaminated crab meat was not allowed to be sold in the United States.